Immediately prior to Christmas, I was fortunate enough to attend the 2014 Fall Meeting of the American Geophysical Union (AGU) which ran from 15th – 19th December in San Francisco, California. The AGU Fall Meeting is a truly unique experience – the largest earth science gathering on the planet, with 25,000 delegates and a multitude of parallel sessions on an enormous range of topics, from deep ocean science to planetary geology; enormous, hangar-like poster halls with an ever-changing collage of scientific outputs, each one the culmination of months or years of hard analysis (in theory anyway!). Totally engaging, overwhelming, exhausting and inspiring. 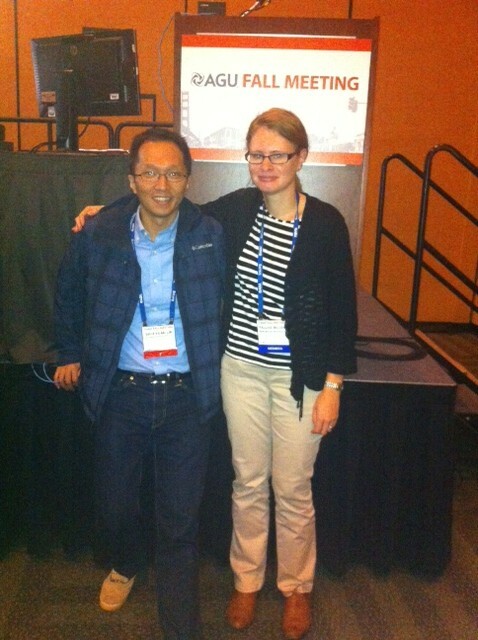 I was lucky enough to have been awarded an oral slot, and on the Thursday morning delivered a presentation on the results of our ongoing NERC-funded project, ‘The spatial and temporal distribution of 20th Century Antarctic Peninsula glacier mass change and its drivers’ – otherwise known as GCAP20C. Our colleague from the British Antarctic Survey/University of Gloucestershire, Lucy Clarke, was also attending and presented orally on her related work on GCAP20C. Both presentations were well received, and I presented to a sizeable audience in a session dedicated to glacier monitoring using remote sensing techniques. The Newcastle component of the research is quantifying multi-decadal mass changes to a benchmark set of 50 glaciers distributed across the Antarctic Peninsula (AP), exploiting a completely untapped resource of >30,000 archival aerial images of the AP dating back to the 1940s. By comparing DEMs derived from this archival imagery to present-day ASTER DEMs we are able to quantify mass balance, and gain a clearer understanding of the spatial distribution of historical glacial change across the Peninsula. Alongside a more refined multi-temporal sub-sample of glaciers being analysed by Lucy and BAS, this information is crucially important to allow better calibration of models which predict mass changes into the future, and simulate how this would impact on processes such as sea level change. Over the week I caught up with a few former Newcastle colleagues, including Liz Petrie (now a lecturer at Glasgow University, having moved in September 2014), and my good friend Shih-Yuan Lin (also known as Eric) who studied alongside me when we were undertaking our PhDs at Newcastle – pictured below. It was good to see both, and especially Eric, as our last face-to-face get together was a full 6 years ago now, at the ISPRS Congress in 2008. During my only previous visit to the AGU FAll Meeting in 2006, I was unfortunate enough to encounter a week of incessant torrential rain. However, California has been experiencing drought conditions for quite some time, and prospects this year looked more encouraging (for me at least, if not for Californian farmers…). I was hoping for an escape from the cold, icy conditions which had gripped Newcastle in the early weeks of December. 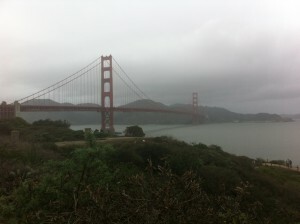 Some mild Californian sunshine would have been most welcome. 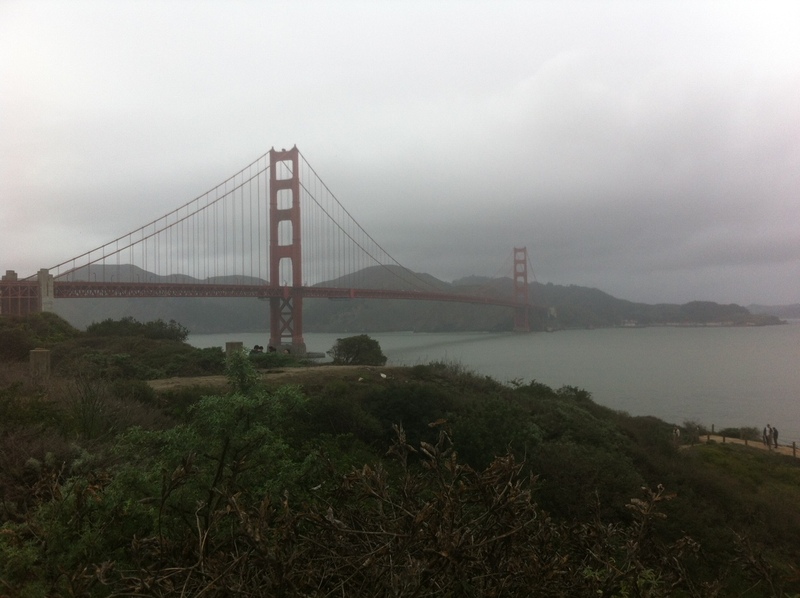 My hopes were dashed however; the grey and misty, but initially dry skies which greeted my arrival at San Francisco International Airport were as good as it got – the rain quickly moved in as the conference got underway, and stayed put for the whole week. Nevertheless, San Francisco is a pretty special place to experience under any conditions, and with my imminent departure from Newcastle to a new job at the James Hutton Institute in Aberdeen, this final trip as an ambassador of Newcastle’s Geomatics group to AGU 2014 will stay with me for a long time to come. Next Next post: Geospatial Engineering in the News!